Game Description The game follows Brack Malaleuca, an employee at Hammond Motors in the city of Valac, as he discovers an alien ship and ultimately must save the world. When I first booted up Acidopolis, I was quite hopeful, especially when I saw the beautiful title screen. Unfortunately, it was all downhill from there. After some opening text hinting at the adventure supposedly to come (which had spelling errors), I excitedly began to play, only to discover a ludicrously picky parser, no clue of how to proceed, and no depth of detail in the rooms at all. I couldn't figure out for the life of me what I was supposed to do from the very beginning. 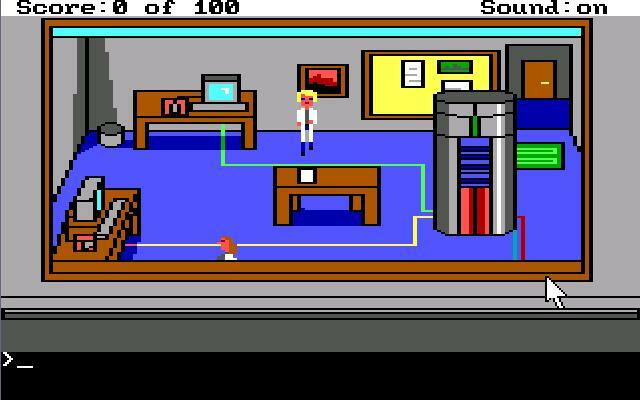 For example, the game begins with you working in a lab on an anti-gravity machine. First thing I do is type "look" to get a description of my surroundings, which makes mention of desks, a bulletin board, and the machine, which is referred to as a generator. There is also another person walking randomly around the room. First thing I do is look at the bulletin board, only for the game to basically say that there's nothing of interest. Then I look at the desks mentioned in the room description to see if there's anything of interest. I get a default parser error message. Attempting to check out the trash can next to the desk yields the same result. I look at the generator, only to discover to my shock that the most interesting and clearly important object in the room cannot even be addressed by the term used in the room description! You CAN, however, refer to it as a "machine." It was at about that point that my heart really started to sink. Trying to use the computer only makes a fourth wall joke. "Turn on machine" does nothing, although "use machine" results in a cute death sequence. I couldn't get the parser to even recognize the fact that there was another person in the room. The game hints that I'm supposed to work on the machine, but I couldn't figure out how to do that, due to the picky parser, and the complete lack of direction. I do a little exploring, trying to find something to do. I find several rooms with nothing of interest, a book that gives me two points when I pick it up, a field that turns out to only be revealed as a dead end when you walk all the way to the other side, a dumpster I can't search, and a car I can't drive "yet." Finally, I gave up. I couldn't even figure out what the first puzzle was, much less how to solve it. I couldn't figure out where to go. I couldn't even interact with anything in a meaningful way. This game seemed to have so much potential. The graphics are good, and even though I didn't hear any music, even on the title screen, there are a few well-placed sound effects. Unfortunately, the ratio of things mentioned in the game's text and shown in the room graphics to what you can actually interact with is abysmal, the parser is infuriatingly picky, and I, an adventure game veteran, couldn't figure out how to progress from the very beginning. I couldn't even get the plot to kick in. Acidopolis might be a good game underneath, but after spending my whole experience dealing with nothing but flaws, I feel that it isn't worth the effort to find out.